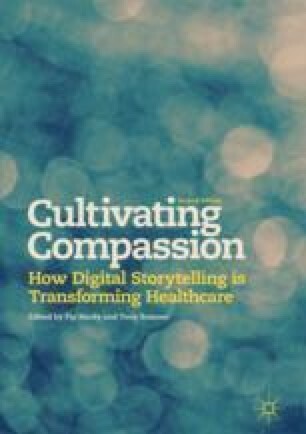 Elspeth McLean describes a collaboration between people with experience of using health services and staff of the School of Health Sciences at the University of Liverpool to enhance student learning through making and using digital stories. McLean discusses the development and outcomes of a variety of opportunities for active learning using digital stories, including the use of digital stories in lectures, in small groups, in Q&A sessions and in virtual learning environments. Key themes are: how using digital stories can enrich student learning, coping with the technology, why digital stories are more effective than videos found on the internet, and that using digital stories enhances and develops opportunities for students to meet and learn from people face to face. This chapter was written with the help of storytellers Judy Bowker, Kath Corrie, Stephen Cronin and Pat Lavery and lecturers Bev Ball, Joy Burrill, Cath Gordon, Maria Tiffin and Louise Waywell.